I bought a new face cream last month. According to my facial lady, the Floxia Rejuvenating Cream removes fine lines and wrinkles, giving the skin a botox-like effect. It was highly recommended so I decided to give it a try. I used it immediately that night and I was pleasantly surprised to find that it was not greasy, unlike most night face creams that I had previously tried. It went on smoothly and was very mildly fragranced - another plus point as I steer clear of skincare products that make me smell like a perfume factory. It remains a mystery to me how people could withstand the same overpowering smell that gave me headaches and a light-headed feeling. The next morning, I could see a difference to my face. It felt softer and smoother, and more hydrated. I was excited and motivated enough by the almost instant results to continue using it nightly. So, after about a month's use now, I am happy with my improved complexion. 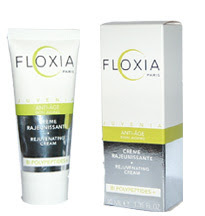 The Floxia Rejuvenating Cream is no miracle cream so I certainly do not expect to see a face with flawless porcelain-like complexion in the mirror. But I am more than pleased to note that there has been a noticeable improvement. My aunt visited me today and remarked that my complexion is now fairer. She just saw me 2 weeks ago! In case you are wondering....Nope, I did not let on my secret. I chose to hug it to myself with a smile.